Discover the new and improved 2017 Kia Cadenza full-size sedan at Southern Kia Lynnhaven in Virginia Beach! Experience the smoother and better overall ride quality, finely tuned performance, luxurious comfort, dynamic safety, and more. Visit Southern Kia Lynnhaven today whether you live in Virginia Beach, Norfolk, Hampton, Cape Charles, Eastville or Exmore. The new 2017 Kia Cadenza features muscular driving dynamics that deliver a better driving experience. It now features highly responsive steering and an 8-speed automatic transmission that shifts gears seamlessly for an overall ride that's smoother and much more effortless. Take on the streets with up to 290 horsepower thanks to the Cadenza Limited's V6 engine. It's more horsepower than you'll get in the Toyota Avalon Limited or the Lexus ES 350! In fact, the 2017 Kia Cadenza Limited is certified to provide better overall handling performance than the Lexus ES 350! On the inside, the 2017 Kia Cadenza Limited has a wider and cleaner design with extended legroom. It's interior material quality is comparable to that of the 2017 Lexus ES 350 Ultra Luxury, offering Nappa leather seats and fine-tuned temperature control. Plus, you'll enjoy a more soundproof ride thanks to the New Cadenza's sound-dampening glass and full underbody cover. The 2017 Kia Cadenza comes with a host of new safety features that will boost your confidence as you take on the roads of Virginia Beach, Norfolk, Hampton, Cape Charles, Eastville, Exmore and beyond. Plus, the 2017 Kia Cadenza was named as one of the Active Lifestyle Vehicles of the Year during the 13th annual Active Lifestyle Vehicle of The Year Awards held in Chandler, Arizona! It's also an IIHS.org Top Safety Pick+ when equipped with optional front crash prevention and LED headlights. 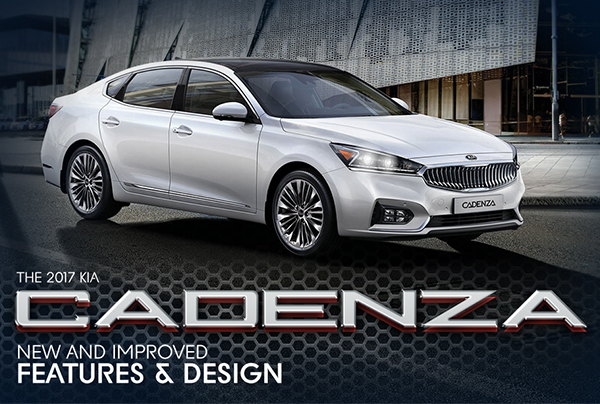 Discover the new 2017 Kia Cadenza full-size sedan featuring a new design, improved performance and a host of new features! Fill out the form to schedule a test drive or visit Southern Kia Lynnhaven today, serving drivers in Virginia Beach, Norfolk, Hampton, Cape Charles, Eastville and Exmore. Plus, get a lifetime of benefits when you buy at Southern Kia Lynnhaven through our exclusive Southern Hospitality Buyers program. For more information, contact us today!